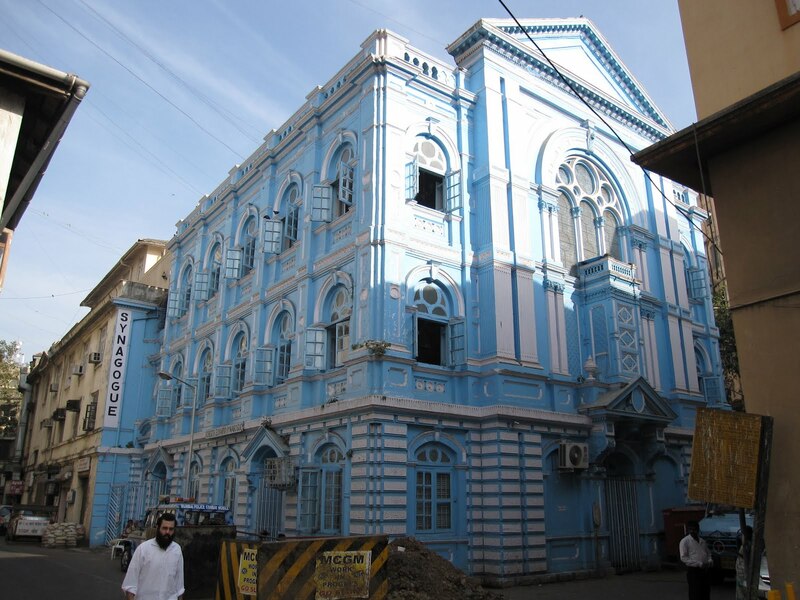 The Keneseth Eliyahoo Synagogue in Mumbai, India. flickr/Stefan Krasowski. Last October, Sandeep Chakravorty and Dani Dayan, consuls general in New York of, respectively, India and Israel, introduced the authors of a recently published book about Indian Jewish architecture. Indian Jewish architecture? The existence of such a thing would surely be as much a surprise to many readers as it clearly was to Consul Chakravorty. But in fact some of the most noteworthy sites in India’s major cities bear Jewish names, and a remarkable collection of historic architecture, built by and for an Indian Jewish community dating from pre-Roman times, still survives. The self-assigned task of the co-authors, one a historian of expatriate communities in India and the other a professor of architectural history at the Indian Institute of Science, Education, and Research in Pune, is not so much to analyze each Jewish monument and building as to summarize and highlight. 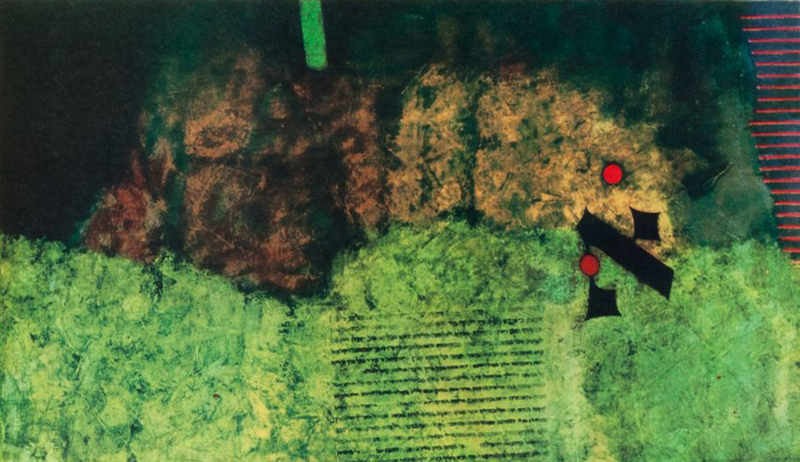 This they do through an abundance of anecdotal information in an easy-to-grasp text that is interspersed with masterful photographs by Surendra Kumar. What emerges from their presentation is a portrait of a community of enduring faith and proudly distinct character, simultaneously in harmony with its neighbors and well-integrated in a variety of professions at different levels of society. The Jewish community that remains in India today, numbering in the low thousands, is a shadow of its former self—roughly a fifth of its pre-1948 size—and some of its synagogues, cemeteries, and residences have found alternative uses. Yet, unlike the case of so many Jews who fled neighboring countries amid waves of anti-Semitism during the years leading up to and after the establishment of the state of Israel, those who left India did so of their own accord. In this light, the 2008 attack on Mumbai’s Chabad House by Pakistani terrorists, killing six Jews including Rabbi Gavriel Holtzberg and his pregnant wife, was an anomalous event. Today, the building’s kosher restaurant and prayer hall are still functioning, and the upper floors have been repaired and converted into a museum and memorial. With that tragic exception, the structures built by and for Jews in the region covered by Jewish Heritage of the Deccan testify to a history of peaceful coexistence. 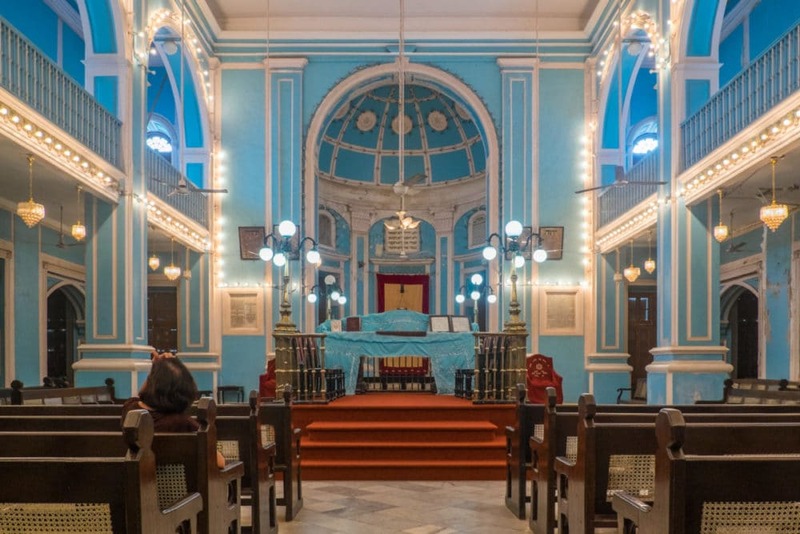 Synagogues remain marked by Hebrew letters and Jewish motifs for all to see, Jewish communities can still be found scattered throughout Mumbai and Pune, and some of the area’s best-known buildings proudly display the names of their Jewish benefactors. The Jewish architecture of Mumbai and its surroundings is not uniform. A closer look reveals two separate styles, each particular to one or the other of the area’s two Jewish communities: the Bene Israel (“Sons of Israel”) and the Baghdadi Jews. The former community traces its origins to seven Jewish couples fleeing Seleucid persecution in the Land of Israel and shipwrecked on the Northern Konkan coast some 2,200 years ago; the latter was formed in the 19th century by successful immigrants to the British colony of India from, mainly, Baghdad in what is now Iraq and Basra in Persia. Whereas the Bene Israel thrived more or less equally under Hindu, Muslim, and British rule, the members of the far more recent Baghdadi community identified themselves less with the native population than with the local British colonial aristocracy—the latter being their “status reference group” (as Robbins and Sohoni put it). Both communities married within the faith, but intermarriage between them was rare. Over time, the Bene Israel, having had little or no contact with Jews outside South Asia until the 18th and 19th centuries, developed particular traditions that caused some among their Baghdadi coreligionists (and later the Israeli chief rabbinate) to question their Jewishness. This may explain in part why the two communities mostly worshipped in separate synagogues—and why buildings commissioned by them exhibit different constructions and styles. Bene Israel architecture, to start there, reflects the specifically Indian character of this Jewish community; foreign idioms, Robbins and Sohoni note, held no attraction for them. Thus, synagogue construction techniques common along the Konkan coast anchored by Mumbai in the north included whitewashed laterite (clay) walls and timber structures supporting pointed, tiled roofs. 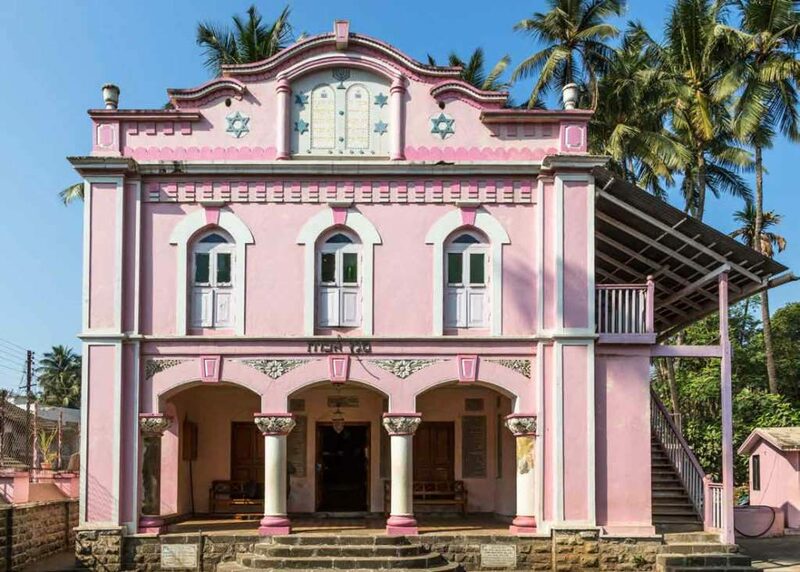 From the period of Portuguese rule starting in the 16th century, semi-circular arches, neo-classical columns and balcãos (frontal porches with seating areas) took hold throughout the subcontinent, exemplified in the Jewish case by the Magen Aboth Synagogue in Alibag. The fact that the Bene Israel, the opposite of a ghettoized community, were concentrated in no precise area but lived throughout Mumbai, Pune, and their suburbs accounts for the diminutive proportions of their houses of worship. The Magen Aboth Synagogue in Alibag, India. Jewish Heritage of the Deccan. But if, from the exterior, Bene Israel architecture may blend in with the surrounding environment, the interiors reveal a unique mélange of Jewish and Indian style. In each synagogue one finds a standard Jewish layout, with a bimah (cantor’s and reader’s desk) in the center of wooden benches arranged in a U-formation, a heikhal (Torah ark) along the wall, and a women’s gallery separated by a m’ḥitsah (partition) or elevated to the second story. All such elements are rendered in exquisite local craftsmanship, expressing at once the value placed on communal tradition and an admiration for regional artistic practices. In Bene Israel tradition, the biblical prophet Elijah occupies a special place of honor, being held to have personally resuscitated the seven shipwrecked couples who founded the community. Where traditional Jewish synagogues worldwide prepare a seat for the prophet during a newborn boy’s brit milah (ritual circumcision), each Bene Israel synagogue prominently features an ornate chair designated for his exclusive use. As for the Baghdadi Jews’ architectural footprint, it is arguably just as considerable in size as that of the much more populous Bene Israel, represented not only in synagogues but also in many surviving mansions, civic monuments, schools, and hospitals built by wealthy and philanthropic patrons. As an upper-class Jewish minority with a social status similar to that of Jews in other British and French colonies, the Baghdadi Jews, while keeping to themselves in terms of faith and in-marriage, hobnobbed with British elites and held high-profile positions in public service (including, in the case of Meyer Nissim, the mayoralty of Bombay). Fittingly, then, the architecture of the Baghdadi Jews suggests their preference for British styles and construction techniques over those of their adopted country. The Gothic Revival and neoclassical buildings and monuments of the Baghdadi Jews, visibly out of place within the local environment, follow the colonial trend of commissioning architecture on par with that of the metropole. 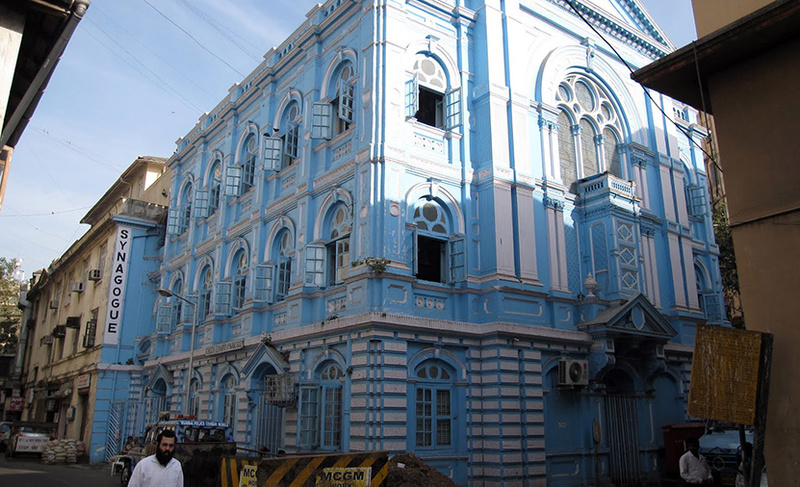 The Ohel David Synagogue in Pune, for instance, features fundamental aspects of European churches (despite the blue coloring that might evoke either an Indian vernacular or a Judaic palette). These include a longitudinal hall, terminating in a semi-circular apse and flanked by colonnaded aisles with windows. It is as though the collective effort by the Baghdadi Jews to “Anglicize” their public image within a foreign, Indian context pervaded even the most private and sacred of realms—a truly rapid transition for an ancient community that must have held memories of synagogues and pilgrimage sites, like the Tomb of Ezekiel in Al Kifl, built in such a vastly different style and form. The inside of the Magen David Synagogue in Byculla, India. Rediscovery Project. Taking this impulse a step farther are the elaborate tombs of members of the Sassoon family. In general, ornate tombs and other markers of excess have little place in Jewish funerary customs, which are characterized rather by simplicity and solemnity. Above-ground structures have even less of a place since Jewish law requires the dead to be interred. Yet multiple men and women in the Sassoon family commissioned grand mausoleums like the Tomb of Lady Hannah Sassoon: sumptuous monuments of permanence that share the style and proportions of the Sassoons’ mansions and that tower over adjacent gravestones, evoking instead the burial chambers of Christian nobility, Islamic rulers, and Roman emperors. That Baghdadi Jews like the Sassoons would adopt an architectural practice so far removed from their own religion’s funerary traditions—and in a land with scant precedent for it—suggests the near-complete determination of this immigrant community to dissociate itself from its origins, from the local populations, and even from its Bene Israel coreligionists. For their public image and identity, the Baghdadi Jews looked west. 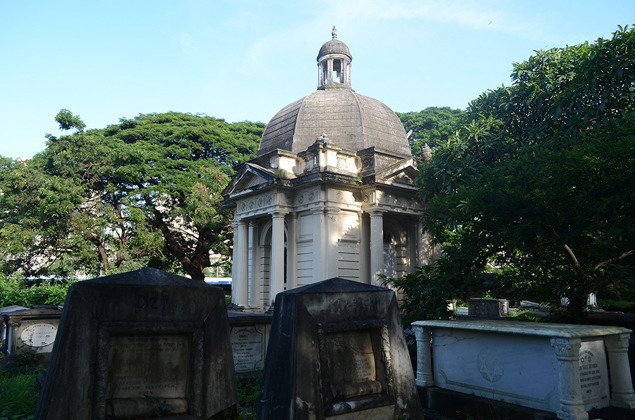 A tomb housing a member of the Sassoon family in Mumbai, India. Times of India. And yet, even from this brief overview of Jewish architecture in and around Mumbai, one is struck less by the dissimilarities between the Bene Israel and the Baghdadi Jews, glaring as those can appear, than by a historically very rare quality they exhibit in common. When it comes to visible markers of Jewish civilization, most countries in the Middle East and Europe manifest only ruins. Here, by contrast, we have two Jewish groups flourishing, holding fast to their faith, and expressing their own particular character as a minority in a foreign land. India presents one nerve center of the diaspora licensed to define its own position within society at large, in an environment distinguished by relative liberty and harmony and nearly devoid of religious persecution. The Bene Israel and the Baghdadi Jews owe their illustrious record of achievement to their own tradition and their own capabilities, but also to that environment. Their architectural treasures show neither the wounds inflicted by forces of barbarism nor any need to live and worship under cover or in disguise. True, few local Jews keep these communities alive today. But their built contributions—mostly intact, in use, and commanding appreciation—vividly illuminate a remarkable Jewish path through time.